Oiling my hair has been a regular practice since childhood. Everyone knows that a careful hair care routine includes a good oil for head massage that works as a tonic for healthy scalp and shaft. In past few usages, I've been appying Halixir Nourishing Hair Oil by Ethicare Remedies that is a concoction of 7 effective oils i.e. Coconut Oil, Sesame Oil, Castor Oil, Amla Oil, Brahmi Oil, Bhringraj Oil and Almond Oil other than few more oils. The Halixir oil comes is a pump-enabled bottle for easy dispensing of oil. 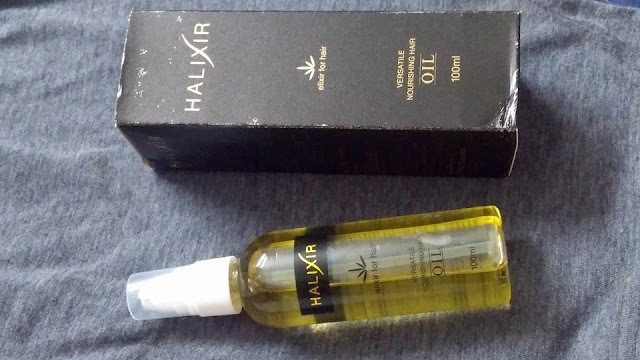 I liked the packaging because it prevents wastage of products since oils generally tend to flow out of usual bottles in excess quantity than required whenever you try to pour it out. 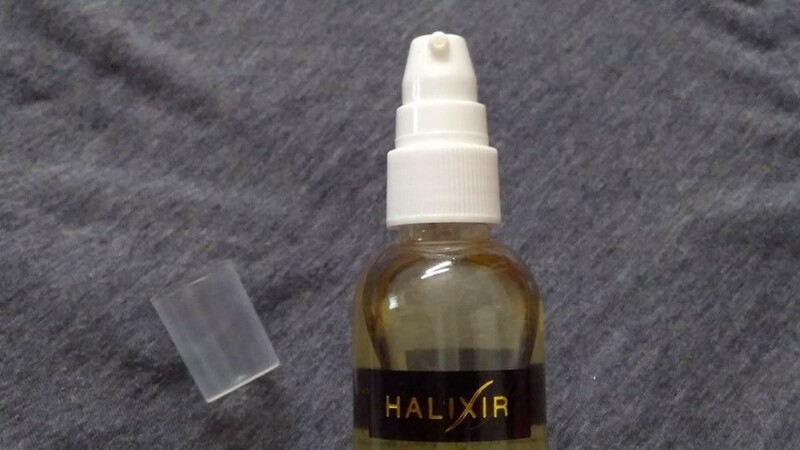 All the details like ingredients, usage direction, price etc is printed on the bottle. Earlier I used to leave a hair oil on my hair overnight, but I discovered that it doesn't add to the benefits by leaving it longer 1-2 hours. So I've made a point to alter my routine accordingly. 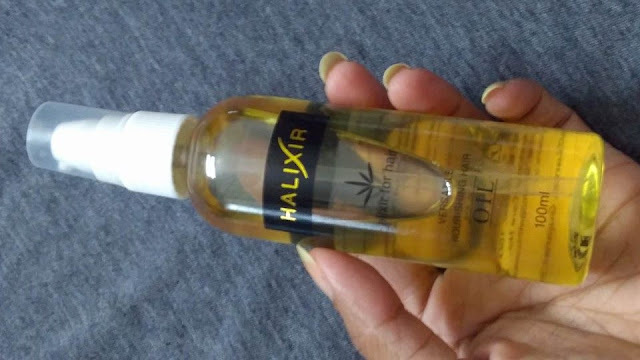 This oil is light in texture and doesn't leave hair greasy. Just ensure to use only the amount that gets absorbed by strands properly, else the excessive oil may obstruct the pores. Coconut oil and Sesame oil have fatty acids for the healthy of hair while amla oil gives antioxidant protection. A non-vigorous and light head massage done regularly will not only improve the tone and texture of your hair, but will stimulate hair growth and inhibit hair fall. The blend of many other natural oils bring nice shine to hair. 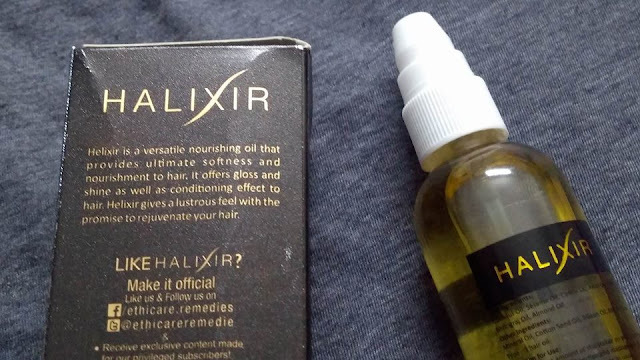 Since the oil is not sticky, women who have rough and frizzy hair may leave the oil onto their hair as a leave-in serum to enable easy detangling and reduced flyaways. The oil smells good and the smell lasts for few hours. My personal choice is to oil my hair in a milder fragrant oil than this one. In my opinion, no hair care product can reduce existing split ends, but yes! 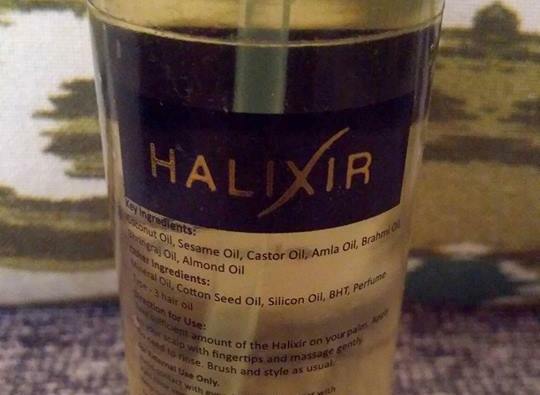 if your hair have been cared enough to prevent splitting when you start using Halixir, then this oil will certainly protect that condition.